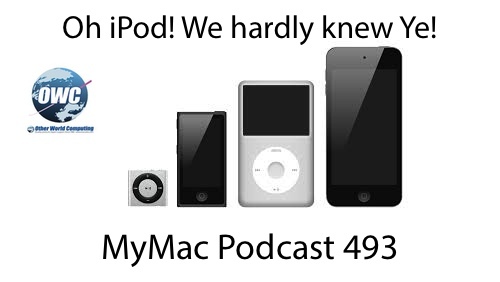 MyMac Podcast #493 – Oh iPod, we hardly knew Ye! Both GMen are sick this week, well more so than usual so please excuse the occasional cough. So the iPod has dropped more than 50% year over year in sales. Will Apple start pruning or will it be kept around for sentimental reasons? Guy and Gaz have their favorites and which ones they would dump and how they would change some of them to be more relevant today. Don’t forget to send in your GMen bumpers to have a chance to win in the 500th podcast contest! Guy’s App Pick: Auria LE, a multi-track DAW for iOS. $24.99. Gaz’s App Pick: Konvert IOS App $0.99 or £0.66 nice little conversion App also trying out Heyday a day to day journaling App. I second Guy’s recommendation of Auria LE, which is a really high powered multitrack editor. I actually use Cubasis, which is a direct competitor of Auria (48 tracks, $50), but I bought it before Auria LE was released. Auria LE will have more than enough power for most users at half the price. I am also pretty disgusted at the lack of change in the iPod Touch. I bought mine when it was the first model with 64GB (at a time when the iPhone maxed out at 32GB). It is now so old that it can’t even run iOS 7, and neither of the upgrades which would have made me want to buy a new one have happened – releasing a 128GB model or adding cellular. I can’t see spending $400 to get almost the same device I have now. I use my Touch mostly for audio and video playback, with some use of email/social networks, Netflix, Skype, and casual gaming. I wound up committing the heresy of buying a Windows Phone, the Nokia Lumia 520. It can do almost everything I use my Touch for (the game selection is more limited), but the phone (no contract) and a 64GB microSD card were under $100 combined. Plus (although I haven’t even bothered to install the SIM card yet), it CAN actually be used as a phone if needed.